Railpictures.ca - Daniel Odette Photo: Divided by the Canadian and American border, locomotives of each country’s national passenger railroads sit on their respective sides of the bridge. Amtrak 121 was uncooperative and refused to pull the Maple Leaf back to the states on this morning. After hours of trying to resolve the situation, Via 6419 was finally placed on to lead the Maple Leaf to Niagara Falls. 6419 has done its job, and one of Via’s finest begins to throw the switch so 6419 can back into the siding. On the other side of the Whirlpool Rapids bridge on the American side is Amtrak 110. It will back across the bridge as soon as 6419 backs into the siding and the switch is realigned. It will take over the duties of Via 6419 to Albany-Rensselaer. 121 was coupled to the Maple Leaf alone at this point, still capable of providing HEP to the coaches, but unable to move under its own power. These type of movements are quite rare, but it is something Via and Amtrak have performed before. The majority of Amtrak’s P42DC’s are one to two years overdue for another rebuild or retirement, so perhaps this will become more frequent since it appears since neither seem imminent under Amtrak’s budget woes. Amtrak used two crews for this move, with one already on the Canadian side and the other in Amtrak 110. Since ownership of the Whirlpool’s upper deck was transferred to Amtrak, the Via unit is technically in Amtrak territory, as the sign on the left adjacent to the bridge indicates. The Canadian flag is flying at half mast for the 16 people that lost their lives in the Humboldt Broncos bus tragedy, likely with each day dedicated to each life lost. This move occurred only one half hour before the CBSA showed up for the arrival of Via 98. Known to be very territorial and precautious at the station, this shot most certainly would not have been possible if this switching move was done after they arrived. Since Via 97 arrived at Niagara Falls so late, it had to wait for Amtrak 63 (to become Via 98) to depart Niagara Falls, NY. Amtrak 64 (formerly Via 97) left Niagara Falls after the CBSA arrived, anticipating boarding Amtrak 63. The CBSA was very clearly confused, seeing the power was at the other end. 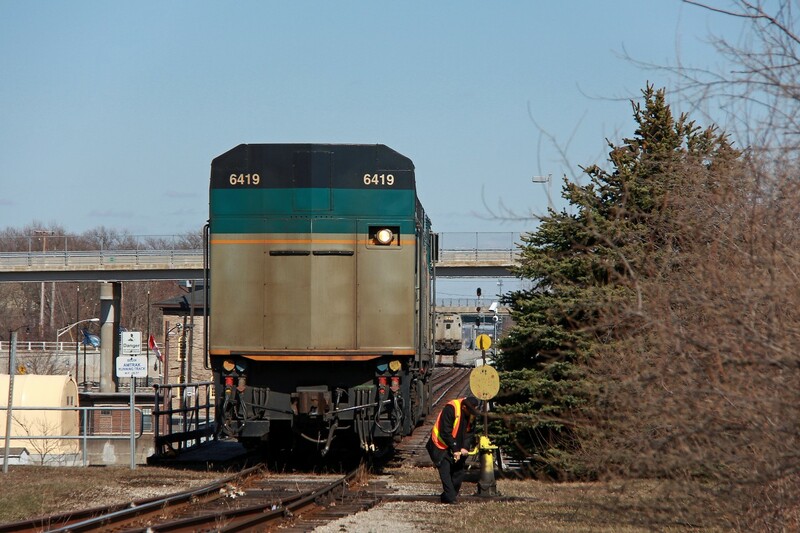 They wandered about talking to the crews, and even hopped on the train at one point, probably under the assumption the passengers were Canadian arrivals on 63. Thankfully, the poor passengers, already seven hours late, did not have to deal with confused CBSA guards. The American CBP still await them however. | Railpictures.ca – Canadian Railway Photography – photographie ferroviaire Canadienne. Caption: Divided by the Canadian and American border, locomotives of each country's national passenger railroads sit on their respective sides of the bridge. Amtrak 121 was uncooperative and refused to pull the Maple Leaf back to the states on this morning. After hours of trying to resolve the situation, Via 6419 was finally placed on to lead the Maple Leaf to Niagara Falls. 6419 has done its job, and one of Via's finest begins to throw the switch so 6419 can back into the siding. On the other side of the Whirlpool Rapids bridge on the American side is Amtrak 110. It will back across the bridge as soon as 6419 backs into the siding and the switch is realigned. It will take over the duties of Via 6419 to Albany-Rensselaer. 121 was coupled to the Maple Leaf alone at this point, still capable of providing HEP to the coaches, but unable to move under its own power. These type of movements are quite rare, but it is something Via and Amtrak have performed before. The majority of Amtrak's P42DC's are one to two years overdue for another rebuild or retirement, so perhaps this will become more frequent since it appears since neither seem imminent under Amtrak's budget woes. Amtrak used two crews for this move, with one already on the Canadian side and the other in Amtrak 110. Since ownership of the Whirlpool's upper deck was transferred to Amtrak, the Via unit is technically in Amtrak territory, as the sign on the left adjacent to the bridge indicates. The Canadian flag is flying at half mast for the 16 people that lost their lives in the Humboldt Broncos bus tragedy, likely with each day dedicated to each life lost. This move occurred only one half hour before the CBSA showed up for the arrival of Via 98. Known to be very territorial and precautious at the station, this shot most certainly would not have been possible if this switching move was done after they arrived. Since Via 97 arrived at Niagara Falls so late, it had to wait for Amtrak 63 (to become Via 98) to depart Niagara Falls, NY. Amtrak 64 (formerly Via 97) left Niagara Falls after the CBSA arrived, anticipating boarding Amtrak 63. The CBSA was very clearly confused, seeing the power was at the other end. They wandered about talking to the crews, and even hopped on the train at one point, probably under the assumption the passengers were Canadian arrivals on 63. Thankfully, the poor passengers, already seven hours late, did not have to deal with confused CBSA guards. The American CBP still await them however. I wouldn’t mind going to Rouses Point one day. I will admit though, it’s nice having a large river separating the border. You don’t have to worry about the guards on the other side potentially screaming at you if you get a little close. This is clearly an interesting shot. If you want to get even closer to Canada, go to Rouses Point, NY and the Amtrak Station there. You look off to the right and you’re maybe 30-50ft from the Canadian border. But way more cameras and Xray machines there.